The weather was gorgeous. I arrived in Fairmont, received another warm welcome at the Clinton campaign office - more about the office in a separate post - and received my assignment: visibility and leafleting regarding GOTV. (Campaign office manager Jock G. asked if I felt comfortable talking to strangers. I am proud of myself because I managed to respond with a simple "yes.") Fairmont, West Virginia Governor Joe Manchin's hometown is a lovely town. At the main intersection near the campaign office volunteers were at all corners, with signs - handmade and otherwise. 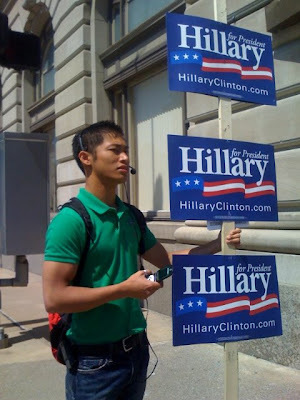 One amazing young man stood beside me with a sign and simultaneously made GOTV calls for Senator Clinton, as I waved and hollered "Honk for Hillary." I tried not to shout just when he got somebody on the phone. After grabbing some worried, I strolled the town to leaflet, getting an opportunity to see some amazing architecture, a beautiful library, and shop with the best stuffed animals. My personal favorite memories of the day were watching as people in Fairmont, greeted each other warmly and asked how one another were - so often this exchange took place between a black person and a white person - and in the present context that must be noted. I also loved the way the truck drivers honked for Hillary and the women who really cruised through the intersection, horns sounding out loud and clear. One woman told me from her car that she had received a call on behalf of Senator Obama that day. Her reply: "I don't want to be rude, but please...don't be silly. We are all for Hillary!" "I don't want to be rude, but please...don't be silly. We are all for Hillary!" What a great story! I love that you keep those of us that are unable to travel in the loop. It's so good to know that there are so many Hillary supporters out there.